MANILA, Phiippines – It’s another one off the back of embattled former senator Juan Ponce Enrile. He’s no longer a defendant in a 1987 civil suit against Marcos and his cronies in connection with behest loans considered part of the late dictator’s ill-gotten wealth. 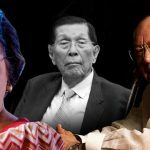 The anti-graft court Sandiganbayan affirmed in an April 18 ruling a resolution issued in 2004 removing Enrile from a list of 14 defendants connected with P670 million worth of behest loans. A behest loan is credit considered unlawful because it is disadvantageous to the lender, the government. 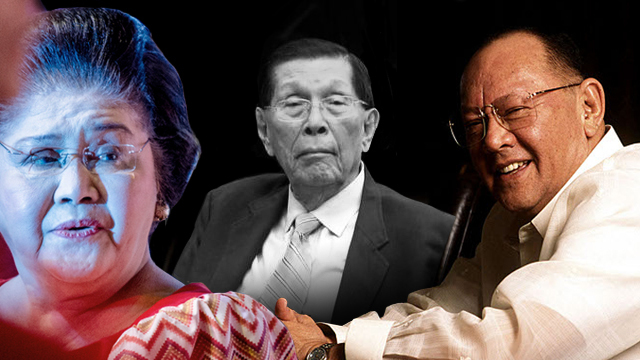 The 1987 case which used to include Enrile involves former president Ferdinand Marcos, Imelda Marcos, and Eduardo “Danding” Cojuangco Jr.
During Marcos’ presidency, when Enrile served as defense minister, P670 million worth of loans were granted to companies owned or controlled by Cojuangco, namely Northern Cement Corporation and Integrated Textile Mills Corporation. The loans came from the Development Bank of the Philippines (DBP) and were considered behest or unlawful because the companies had inadequate collaterals, and the projects which the loans were for never materialized. In his motion filed on May 15, 2001, Enrile pointed out that the complaint failed to specify what unlawful action he was supposed to have committed to warrant his inclusion in the case. He said that neither the complaint nor the pre-trial brief submitted by the Presidential Commission on Good Government (PCGG) provided a basis for the case against him. In December 2004, the Sandiganbayan first division excluded Enrile because the complaint filed before the court did not make a single mention of Enrile’s participation in the transactions. Enrile’s name is seen only in the first pages of the information where the defendants are listed. “With no single evidence on the record linking defendant to the alleged conspiracy, his motion to be dropped from the complaint must be granted,” ruled the first division, which was then composed of now Supreme Court (SC) justices Teresita Leonardo-De Castro and Diosdado Peralta, and dismissed justice Gregory Ong. The PCGG, tasked to recover Marcos’ loot, appealed the resolution on January 12, 2005. Enrile filed his opposition the following month. “In the subject motion for reconsideration, the plaintiff still failed to include factual averments to demonstrate the participation of defendant Enrile in the acquisition of ill-gotten wealth,” the April 18, 2017 resolution said. The resolution was penned by second division chair Associate Justice Michael Frederick Musngi with concurrences from Associate Justices Oscar Herrera and Zaldy Trespeses. The case against all the other accused remains alive.